Mozilla plans to launch cryptomining and fingerprinting protection in Firefox 67 to improve user privacy. The organization revealed in 2018 that it had plans to improve privacy in Firefox. Mozilla added content blocking options to Firefox 63 — an update of the browser’s tracking protection functionality — and that it wanted to add more protective features to future versions of Firefox. Cryptominers use the resources of the connecting device to mine cryptocurrency; this leads to an increase in CPU activity and power consumption. Depending on how the miner is configured, it may slow down the entire system and all operations on it as well. Fingerprinting protection is not a new feature. Fingerprinting refers to techniques to create user profiles for tracking using information provided by the connecting browser and device, and certain scripts if permitted to run. Mozilla introduced a preference to block some fingerprinting methods in Firefox 41. 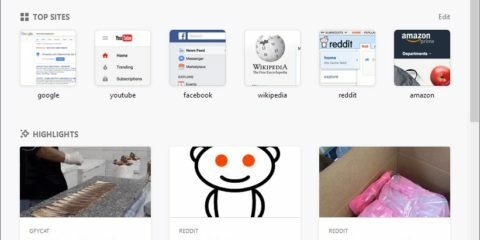 First signs of an integration in Firefox’s main user interface showed up in May 2018. 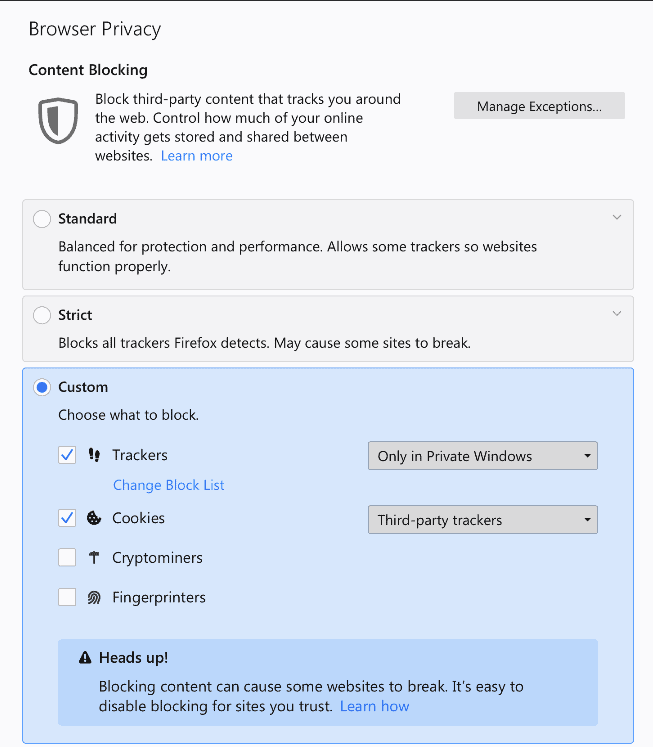 Mozilla showcased extensions to the content blocking functionality back then that included options to block analytics, fingerprinting, crypto-mining, and social tracking. Only two of those, fingerprinting and cryptomining protections, will find their way into Firefox 67. The options are displayed when users click on the site information icon next to the site URL, and when they launch the privacy options in the Firefox settings. Select custom on the settings page under content blocking to display the new options. It is not clear yet if these options will be enabled by default or if users need to enable them manually in Firefox 57. Just check cryptominers and fingerprinters there to block these on all sites. You may still add exceptions if you want some sites to use the functionality. It is possible that the blocking may block some site functionality from executing correctly. Firefox 67’s release date is May 14, 2019. The introduction of additional protective features is a long overdue step considering Mozilla’s stance in regards to privacy. It remains to be seen if the options are enabled by default or turned off; it would not be of much use to the bulk of users if the latter is the case. 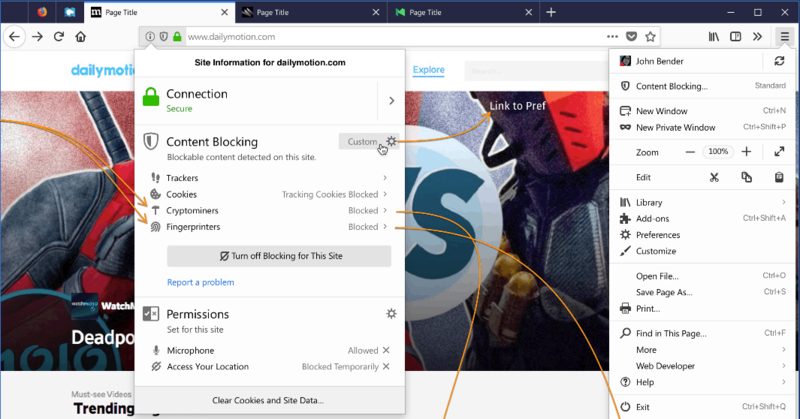 Mozilla is still facing quite the dilemma when it comes to user privacy and content blocking: adding full content blocking options to Firefox would set it apart from Google Chrome. It would improve user privacy, speed up the loading of sites, and be beneficial to security as well. Mozilla’s survival depends on its deals with search engine companies, on the other hand. It is doubtful that Google and others would pay Mozilla a premium for being the default search engine if the Firefox browser would block advertisement by default. Ghacks needs you. You can find out how to support us here or support the site directly by becoming a Patreon. Thank you for being a Ghacks reader. The post Firefox 67: Cryptomining and Fingerprinting protection appeared first on gHacks Technology News. Google Images may soon feature "shoppable ads"